In this episode, I talk about my thoughts on the Apple Event today and their upcoming services: Apple News+, Apple Arcade, Apple TV+ and the new Apple Card. In this episode, I talk about my year theme for 2019: Clarity, and what that means for my job, my projects, and my podcasts. In this short episode, I talk about balancing what to talk about where now that I have several podcasts. I also play the Two Dads Talking theme song for those that haven’t had a chance to listen to that longer podcast. In this episode, I talk about a variety of projects I’ve been working on: My Url Is, Two Dads Talking, My Website, not to mention raising a tiny human. In this episode, I talk about an idea that I have for a system-wife iOS Dark Mode, the response I’ve gotten so far and what’s next. In this episode, I talk about a new podcast project I’m working on. In this episode, I talk about a new book coming out by my favorite author and getting to be on the launch team. In this episode, I talk about trying out Over-the-Air broadcasts and other options to replace my family’s cable TV subscription. In this episode, I talk about the hardest experience I’ve had and what it means for us as humans. In this episode, I grill some burgers while talking about grilling and how my perspective on it has changed over time. In this short episode, I talk about time and how it quickly it can move, as well as what the next seven days hold for me. Links and Show Notes You can find all past and future episodes at http://30andcounting.me. In this episode, I talk about some nice minimalistic homepages I’ve seen recently as well as some other inspiration pages I’ve looked at. Thinking through some pros and cons of my website and how it could look. In this episode, I talk about an unfortunate mistake I made when painting over Memorial Day and why I’ve been silent for the last 3 weeks. I also talk about my first iOS App to be released and the pre-order. In this episode, I talk about using the Full Focus Planner by Michael Hyatt and the benefits that it’s been providing me and my family. 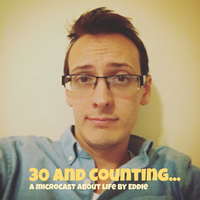 30 and Counting, Episode 5: Leaving Facebook... and replying over email? In this episode, I talk about the 5k Zombies, Run race I just finished. Some thoughts on running motivation and my hopes for future races. In this episode, I talk about a failed dinner meal (darn you, mustard!) and what that can mean for how we respond to unexpected change and failure. On my way to get a drink from Starbucks, I discuss weather woes and excitement for an upcoming virtual 5k run.